The Wieliczka Salt Mine is an example of a well organized, large industrial establishment. The evolution of the mining processes since the Middle Ages is perfectly illustrated here, due to the conservation of the old galleries and the exhibition of tools used. First references to the winning of salt in Wieliczka were made in 1044. Salt was the most important economic commodity in Poland during the Middle Ages. The mining of salt quickly became a government monopoly. Technological progress turned the Wieliczka Salt Mine into a modern business enterprise in the 16th century. Machinery was being used to improve productivity, and the search for new salt deposits took the miners lower and lower underground. The production of salt here ceased only in 1992 due to a heavy flooding. 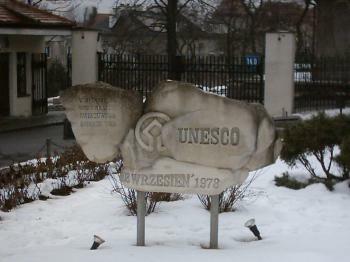 The Salt Mines of Wieliczka were on the first World Heritage List ever, publicized in 1978. The Wieliczka Salt Mine is an important attraction in the Krakow area. It has a long history of tourism: already in the 15th century visitors were taken underground. Prominent Europeans like Copernicus, Goethe and Chopin also visited. The site nowadays attracts thousands of visitors every day in summer, and group tours are conducted in several languages. Fortunately I was here in February, when it wasn't too busy. There are frequent minibuses from Krakow to bring you here. The underground tour takes you on a walk of two km. It passes through 20 caves, many of them adorned with sculptures the miners made. It's quite clean and spacious here, unlike in a coal mine for example. 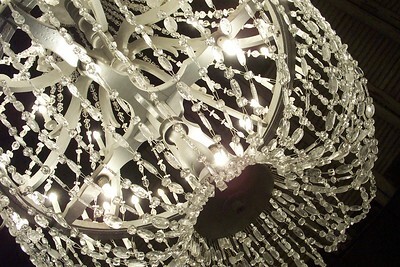 The walls are dark grey everywhere; you can only see they are made of crystals when you hold a light to it. The gangways are held upright by complex wooden structures. Highlight of the tour undoubtedly is the Underground Cathedral. Everything in it is made of salt: the wall decorations (The Last Supper and other biblical scenes), the altar, the religious statues, floor and ceiling. 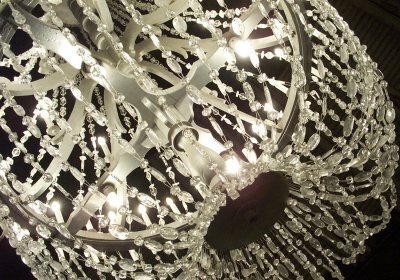 Even the chandeliers are made from salt crystals. This masterpiece was created by three miners in their spare time, taking 68 years of work. The Wieliczka Salt Mine is one of the most popular tourist attractions in the Krakow area. We visited the mine on a weekday in August 2014. We arrived just in time to get tickets for the first English tour at 8.30 am. It was not very crowded, but the barrier tapes and signposts in several languages indicated that they expect a rush of visitors during the day. The tour starts with 380 steps downstairs to the first level. And the first thing you see is - wood, lots of wood, massive trunks and beams for supporting the walls and ceiling. They must have cut down a whole forest only for the section of the visitors route. The inscribed area is almost 1000 hectare large and has about 300 kilometres galleries on nine levels, the deepest being more than 300 metres underground. But the guided walk is only about two kilometres long, less than one percent of the entire mine. Salt mines are distinct from other mining sites: less dusty and narrow, but with spacious excavation chambers. First we walked through several small chambers where historic techniques of salt mining are shown, for example a horse powered winch for transporting the salt, water wheels, or the combustion of the methane gas. 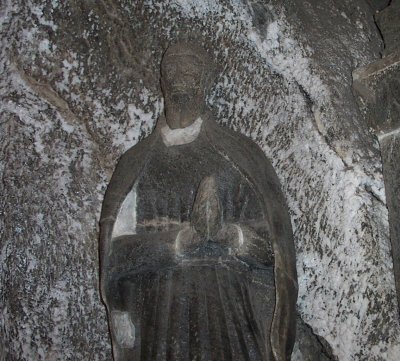 Sculptures carved from rock salt and small chapels illustrate the profound religiosity of the miners. What you would not expect one hundred metres underground: a church of remarkable size, entirely carved from the salt including all the necessary components: altar, stoup, pulpit, crucifix, bas-reliefs, even the tile pattern on the floor, and - inevitable - a statue of Pope John Paul II. But I was even more impressed by the second part of the tour with the most fascinating chambers. Some have brine lakes where the illumination produces beautiful reflections on the water surface (e.g. in the Weimar chamber), others with huge wooden scaffolds such as in the Michalowice chamber (photo). The tour ends at the third level (135 metres) in front of a two-metre high WHS sign, of course carved from the rock salt with the names of the twelve sites that have been inscribed in 1978. Finally, we had to go through an area with souvenir shops, restaurants, conference rooms, and all these things until we got to the elevator that took us back to the surface. The Wieliczka mine is a fascinating site and well worth the steep price of about 18 Euro. A few days later we visited the Bochnia mine, about 30 km from Wieliczka. Unfortunately, there were only tours in Polish language at the day of our visit, thus we could not fully appreciate the multimedia presentations, but the children on our tour seemed to have fun with speaking holograms and sound effects. We walked about two hours through galleries and chambers, a part of the route is covered by an underground train. The tour can be extended by a boat trip on a narrow channel, actually that was the best part of the visit. All in all the Bochnia mine is less impressive compared to Wieliczka, the chambers are smaller and less fascinating. I would not recommend to visit both mines unless you have a great passion for mining sites. But the Wieliczka mine should not be missed when you visit Krakow. I visited this WHS in September 2014. It is very close to Krakow which is really a WHS hotspot and perhaps it is one of Poland's most famous WHS and/or tourist attractions. It was interesting to learn that in the past other "tourists" such as Goethe and Copernicus had visited the Wieliczka mine (even though most of what they visited is actually out of bounds due to safety restrictions). In fact what is now known as the Individual Tourist Route represents only around 1% of the Wieliczka salt mine! This is pretty impressive considering that its a 3 hour tour along a 2km trail which takes you down to a depth of 150 metres. The tour itself is quite interesting touching upon different aspects of salt production and giving some insight on other trivial stuff. Even though you're obliged to visit with a group, the place is really huge and nowhere near the claustrophobic size of other mines I've visited such as the Idrija Mine in Slovenia. The highlight of my visit was definitely the Underground Salt Chapel of St. Kinga and the intricate salt carvings and sculptures. I felt that some parts of the mine were quite kitsch to say the least but on the whole this salt mine really has an OUV and is worth seeing. One negative note was the mine exit though: the only way out seemed to be a very narrow and dark lift carrying at least 10 people when its original purpose seemed to be that of carrying tools or equipment NOT people! Not the best solution for anyone suffering from claustrophobia or anxiety! Although I'm glad I visited this mine and the Bochnia mine (smaller and less crowded but less impressive), I very much preferred visiting other salt related industrial WHS on the list such as the Saltworks in France. In October I visited both the Bochnia and Wieliczka salt mines. Bochnia I accessed by train from Krakow Glowny. The mine was entered and exited via the Campi shaft. Although toured in a group, it was more laid back with plenty of stops for photographs. The commentary was only available in Polish. Wieliczka I accesed by bus #304 from near Krakow Glowny station. 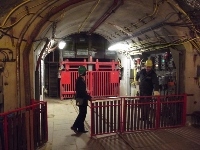 Entry to the mine was via the Danilowicza shaft. This mine receives far more visitors than Bochnia and although I has a commentary in English, the group had to keep moving to keep ahead of the next one. The mine was more extensive, and included a restaurant where I stopped for lunch on the lowest level. I then exited via the St Regis shaft and returned to Krakow by train, which was far more comfortable than the bus. We joined the Cosmos Central Europe tour in March-April 2012 and the Wieliczka Salt Mine was offered as an optional excursion, paying EUR 40 per person. We didn't regret joining the tour of the salt mine. We've been all over Europe and it was our first experience to be in a salt mine. The St. Kinga Chapel was very impressive with the chapel carved entirely of salt. One advise: you should be able to walk for a very long period of time and be able to go up and down long flight of stairs. One of the most incredible places I have ever seen--truly breathtakingly unbelievable to walk into the cathedral 300 feet below ground level. The good news is that after walking down you get to ride up although be it in a cramped elevator--not good if you have claustrophobia. Had a private tour guide in English who was very knowledgable and wise. Highly recommend visiting this site. Way overrated. It is very like visiting any limestone cavern. You might go if you've never been in a large cave before. Because, with the exception of a few second-rate bits of modern sculpture, that's all it is, really, a man-made cave. The only other attractions are the old wooden chapels built in the mines by miners, but they only show you two old ones, and the twentieth centruy big church. As for that, go to India (Ajunta and others) if you want to see really spectacular ancient religious buildings carved into the living stone. Or to any of several monestaries in the Judean desert. There are only two interesting bits of sculpture, two old figures kneeling in worship in an old oterwise wooden chapel. they are interestign because the old-time miners carved them and because, being salt, theyhave 'melted' or weathered. Oh, it's not like it looks like salt. It's not white, not crystalline, doesn't glisten. It just looks like stone. and lots of ther carved objects are disappointing. I had hears about the chandaliers carved at salk. they are wooden frames, with salt melted and formed into clear 'crystals' that are just lumps of clear salt. A few have crude faceting. Not like cut crystals at all. After we had negotiated the incredible number of steps to get down to the first level in the mine, we realised that what we saw was very much worth the effort. The total size of the mine was aweinspiring and the carvings absolutely remarkable. The icing on the cake had to be the very large concert hall, again with carvings and sheer size. I would certainly recommend this visit to anyone!! To have not visited the Wieliczka Salt Mine would have left a large void in my trip to Poland. What is overlooked is the engineering feats performed to make this mine what it is. Let us also remember the torch bearers who in some cases took this job of seeking out methane gas by going forward with lit torches knowing that death was a high reality. Many, it is said, took this job in order to make amends for their past sins. The main Cathedral does nothing less than take your breath away. In my mind I could see religious services being conducted as well as people dancing on what appears to be tile but in reality is salt with etchings to make it look as though it is tile. A must visit sight on your trip to our beloved Motherland, Poland. In our trip to Poland we have visited the Wieliczka salt mine, the most ancient in Europe, exploited since the 13th century (it has never been closed) and constructed on nine levels with 300 km of galleries. It has a maximal depth of 327 m and it’s 5 km long and 1 km large. In the galleries are found wells, corridors, labyrinths, excavations, rooms and chapel cut out of the salt with altars, pulpits and statues. There is also a subterranean lake. If you visit the mines you enter from the Dani³owicz Shaft, a steam engine built in 1874, and visit these rooms: Dani³owicz Shaft Bottom, Nicholas Copernicus Chamber, Chapel of St. Anthony, Janowice Chamber, Burnt Out (Spalone) Chamber, Sielec Chamber, Casimir The Great Chamber, Kunegunda Gallery, Pieskowa Ska³a Chamber, Kunegunda Traverse, Kunegunda Shaft Bottom, Chapel of the Holy Cross, Chapel of St. Kinga (54 m long, 15-18 m wide and 10-12 m high), Erazm Bar¹cz Chamber, Micha³owice Chamber, Drozdowice Chamber, Weimar Chamber, Józef Pi³sudski Chamber, Crossing of The Kazanów Longitudinal Gallery with The Poniatowski Traverse, Stanis³aw Staszic Chamber (36 m high), Warden, Witold Budryk Chamber, Warsaw Chamber (54 m long, 17 m wide and 9 m high), Vistula Chamber, Prinzinger Inclined Drift, Chapel of St. John and Jan Haluszka Chamber. The mine is one of the most beautiful places I have ever seen because of the beauty and the originality of the salt chambers and of the works of art. It's absolutely worth to be visited (if you want to visit it you must walk for 2,2 km with a guided tour) also because it's probably the most beautiful mine in the world and justifies the inscription also because there aren't many mines on the WHL. The Blessed Kinga chapel is a masterpiece and well worthy of its place on the UNESCO list, but, and it is a big but, the whole site is being turned into tourist trap of the worst sort. Being greeted by recent carvings of what looked like the seven dwarfs (with added recordings of 'hello' in a variety of languages) is pathetic. As was the 'sound and light' show in the last cave. This trip is a total waste of money. You are stuck down a mine for over two hours in the cold with no escape. It was the most boring thing I have ever done in my life and was annoyed that I wasted virtually a full day of a short trip to Krakow underground and bored when I could have spent that time in the sunshine. Tacky to the point where I had to laugh or I would have cried!! The Salt Mines were the best thing about our trip to Krakow. Get a mini bus from opposite the new Galleria Krakowski shopping centre for 2.5zl (about 70p in £ sterling)and it only takes about 20 minutes. Thought the mines were fascinating and our guide was very knowledgeable. The Kinga Chapel is breathtaking. Be prepared that the lift back to the surface is somewhat primitive, small and very crowded. But it's over in a few seconds so don't let it put you off. You'll kick yourself if you miss this one! The Salt mines at Wieliczka are impressive, the initial climb down is a little harrowing it is a very long way! But the complex is fascinating. The initial parts seem nice there are some nice chapels carved out of the salt, but nothing real matches the Cathedral like complex in the middle. It is a church carved entirely out of salt, including the floor, sight of an altar of salt surrounded by the last supper again carved out of the same piece of salt is awe-inspiring. I must admit the first time I took the tour in Polish and was a little under whelmed so defiantly aim for a tour in a language you fully understand! The site is easy to get to as there is a regular train there from the centre of Krakow, a journey of about 40 minutes! It is defiantly worth the effort to drag your-self away from Krakow's bars for an afternoon. It is definatly worth a visit here from Krakow. The first time i visited the tour was in Polish and i was left a little disapointed but i went back a few months later and had a tour in English, which i could understand much better!, an i was really impressed. The main Chapple?Cathedral is hugly impresive it looks similar to most cathedrals but the entire thing i carved out of one giant piece of salt! worth the entrance fee alone!. Many caverns/galleries contain works of art, often altars and statues sculpted by miners/artists. We visited several levels by stairs or elevator, and saw many works of art, carved entirely out of salt. Most spectacular was the Blessed Kinga Chapel, carved in one of the largest galleries. There were beautiful three dimensional 'salt' statues, such as the 'Last Supper'. The floor looked like a carefully laid tile design, but further examination shows it's salt carved to look like individual tiles. 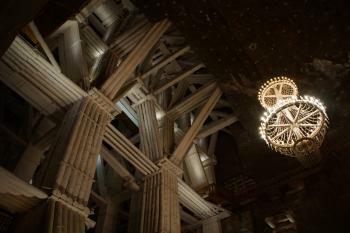 The huge chandeliers in this Cathedral are made of salt, each consisting of many dangling salt crystals. From "Wieliczka Salt Mine" to "Wieliczka and Bochnia Royal Salt Mines"